So the product portfolio of Cera includes high end showers, steam cubicles, whirlpools, sanitary-ware and faucets. It was one of the first company to start innovation like water-saving twin-flush coupled WCs, 4-litre flush WCs, and one-piece WCs. If you have explored bath fitting for your home then you might be aware of Cera brand name.The Company has expanded very fast and slowly made a name for itself. With increase in premium housing segment India will see surge in demand of premium looking highly priced house items. Lets look at stock price performance of the Company. The growth in real world be reflected in stock price. After that we will discuss more about Company prospectus and reasons why this sector will grow in future. Below image shows price performance of the Company since IPO days. It will give you clear indication of returns investors have received over the years. 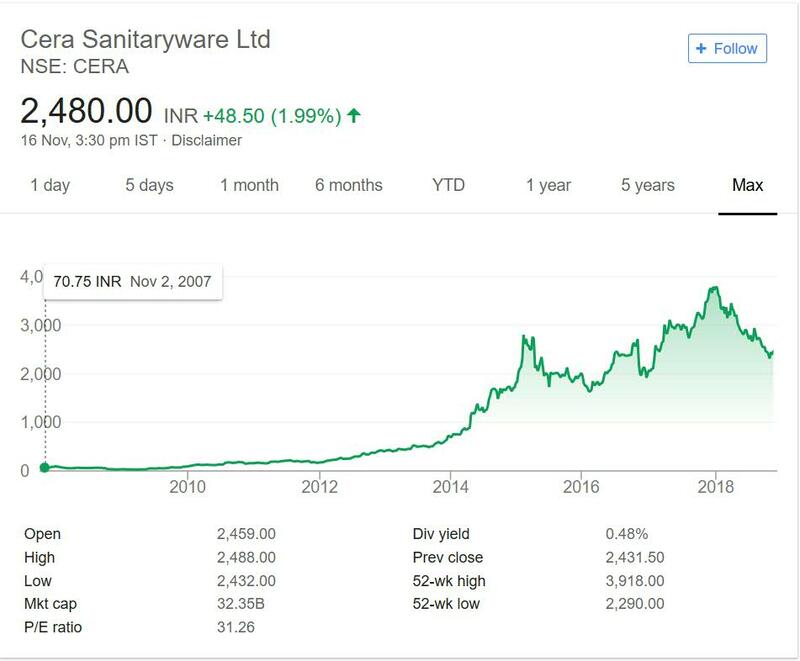 Cera Sanitaryware got listed in year 2007 at humble price of 70. This was not good time to get listed. The stock price did not rise for next 3 years due to 2008 crisis. After that as you can see the prices have rose steadily over the years. From year 2010 to 2018 beginning the prices were on constant rise. Every single year the stock has given positive returns. The initial price of 70 has increased more than 50 fold. It touched highs near 4,000 marks and due to recent correction in market it moved to 2,000 levels. Even at current level it is trading more than 30 times to initial IPO price. So company has made serious money for investors.The paltry amount of 1lakh has turned in more than 30 lakh at current market price. Also the dividend rate is decent. The company pays constant dividend. So it is rewarding investors with good positive growth in price as well as passive dividend. Based on past performance it is one the best multi baggers in market. Cera Sanitaryware is in portfolio of Vijay Kedia. Housing demand in India will be on growth trajectory due to rising population, shift from Rural area to Urban area and growth in purchasing power of Middle class. The demand for premium housing and usage of branded items in house will be hot. People now want marble floor, good designer bath room fittings and decorative mirror and wall areas. These things make one normal house to premium one. With time the usage and penetration of these items is growing. Earlier these were popular among some urban people but nowadays it is becoming part of house essentials for middle and upper middle class. With more and more flats being constructed demand of these items will be on rise. There are not many branded players in this niche. This segment is still unorganized and companies present in this segment are still Mid Caps at best. So there is potential for growth in the segment. Most of the companies will get benefited. Cera having proved in past will be a good pick for future as well. You can have this stock in your watch list and track it for more news and details. I am positive on this sector and have one stock from this sector in my portfolio as of this writing. This is an interesting sector to invest in. It is a growth sector and demand will be there. There are not too many major players so it will not be tough to pick up one winner here. So you can easily compare other companies with Cera Sanitaryware and select the one which suits your investment decision. Many top investors portfolio have stocks from housing material segment .